So I love a good sci-fi story, but many times I’ll get a little bit lost in the science part—especially if things don’t make perfect sense, it’ll go right over my head. 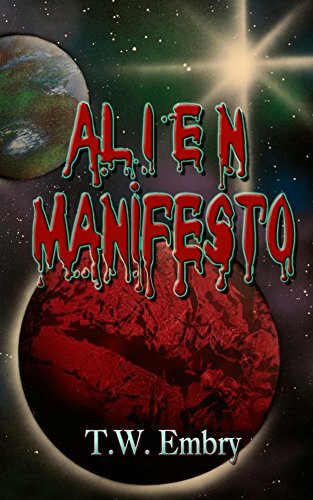 That’s not the case with Alien Manifesto by T.W. Embry. He gave me the sci-fi fix I tend to crave but without the headache that usually goes along with it. Ex. Navy S.E.A.L. Tom Scott is on the wrong side of the law when he suddenly finds himself recruited by an alien intergalactic billionaire named Snarth to join an elite special forces operation. He joins this mixed-species team, their first assignment to steal an alien artifact. This eventually leads them to a planet once ruled by a species called the Ones, (at one time the most feared alien force in all the known universes). With the Ones supposedly now extinct, they go to this planet in search of precious jewels, but find much more than they bargained for, all their lives placed in danger. Sound like a fun ride? You bet, and much more besides. This is a super-fast-paced story, almost too fast for my personal taste, but sure to keep you on your toes from start to finish. A real page-turner if I ever came across one. I read this in two nights, and it would’ve been one if I hadn’t needed to fit my work in there somewhere. Never once did I feel the urge to skim, and being a writer and editor myself, this is saying a lot. Believe me, if the story lags, even a little, I skim. So even though I grinned like a little kid through most of it, I give this story four over five stars because I did crave a little more depth from the characters, especially at the start. This is where that fast pace comes into play. By the end of this first story in the series though, I felt I had a good feel for all the characters involved: which included Tom, another human known as the Irishman, a feline assassin, an alien canine, a spider, and Snarth (their billionaire boss). Here’s the deal. I finished this story and immediately fired up the kindle to go in search of the next novel in line by Embry. Should be enough said. Go out and pick up a copy for yourself. You won’t be sorry. Posted by Denna Holm on September 10, 2016 in Archives and tagged alien, Crimson Cloak Publishing, fantasy, Navy S.E.A.L., Romance, Science Fiction.